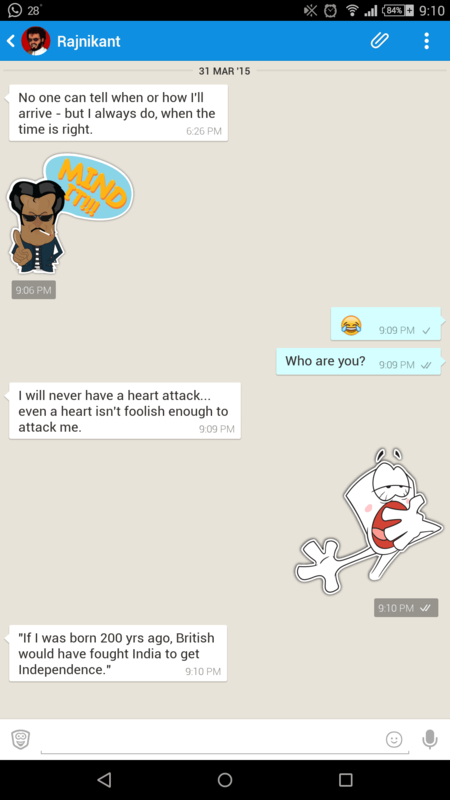 After the tremendous success of Natasha Bot, a virtual assistant of Hike Messenger, they are back with another funny Rajnikant Bot to entertain us. Didn’t get the Rajnikant on Hike yet? Don’t worry, here we will discuss step by step how to activate Rajnikant virtual assistant and enable Rajnikant on Hike Messenger. Dive into a mood of fun and enjoy the Rajnikant Jokes on Hike. Well, they didn’t stop here. Just about a month earlier, they started their virtual assistant services. They brought Natasha, a virtual assistant that talks to you and replies to your commands. It was developed a lot to understand what message we are conveying, and it could also give us some good info with some preset hashtags. Natasha on Hike have become very popular nowadays and it has become a good timepass. Rajnikant Jokes on Hike: Mind It! Just after the wide acceptance of Natasha on Hike, Hike developers made Rajnikant! This is also a virtual assistant that keeps you entertained with funny rajnikant jokes, but with a twist. This bot doesn’t care to reply to your messages efficiently, as it needs to be…it goes in its own Rajni Style! It does not care to read your messages and throws a Rajnikant Jokes as a reply. Cool? Eh! 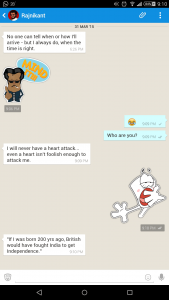 How to Activate Rajnikant Jokes and Natasha virtual assistant on Hike Messenger? 1. 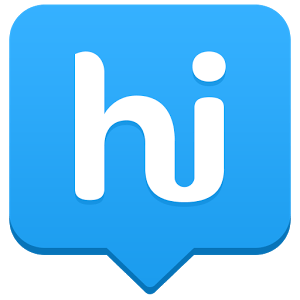 Update Hike Messenger latest version from Google Play. Click here to download. 2. Check for Rajni blessings! You should have got it automatic. 3. Open Hike. Click on the top right settings. It will open the hike settings page. 4. Click Account. It will open your account settings. 5. Click Backup Account. Backing up account is very very necessary in this case. It helps to restore your old chats and connections. 6. Click Reset Account. A popup dialog box will load: Are you sure you want to reset your account? Click Reset account to confirm. 7. Now your account will be reset and all your info will be wiped. You need to re-sign in again to your account. 8. Open Hike, enter your mobile number, verify otp and then sign in as usual like you did when you installed hike for the first time. 9. You will get a popup: Message Backup Found. Do you want to restore? Click Restore to restore your old chats. This saves your chats from being deleted. 10. Done and all set. Rajnikant will congratulate you very soon for inviting him. 11. You can also find Natasha your personal virtual assistant who is able to understand your commands and reply accordingly. Well, this bot was created just to entertain you all day long with funny Rajnikant jokes and keep you hooked. All you need to do is ping him anything and he will reply back a joke! Don’t expect him to understand your words, because he is after all Rajnikant and has his own style! You can refer to the image in the above where I tried to communicate with Rajnikant but couldn’t establish it successfully! Have fun with Rajnikant! Enjoy! This is a real assistant from Hike developers and she is coded to answer to your messages wisely, entertain you, and give you some real and handy information based on some preset hashtags. She is mild and listens to you. And tries to reply you back! Currently she is under rapid development and we hope when she is further developed, we can get Natasha as a more feature rich assistant and guide. 1. 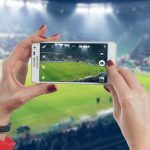 It can check out any movie details and ratings. Type #movie and enter the movie name after that and send. 2. It can check the weather at any place of the world. All you need is to type #weather followed by the name of the place. 3. It can also check out coupons from your favorite websites. Just type #coupon followed by the coupon website name. 4. Want some handy Wikipedia info of anything? Type #wiki followed by the article name. 5. Fake Calling! Yeah, Natasha can do a fake call for you and save you. Just type #fakecall and you will receive a call in a minute. It also supports DND registered numbers so don’t worry. Just chill. 6. Need some inspirational quotes? Type #quote and send, and she will send you a beautiful quote. 7. What can be more entertaining than hot facts? Type #fact and send to get a cool fact. 8. Need to know the meaning of any word? No problem, just type #dict followed by the word whose meaning you want. It will provide you that too. 9. Feeling Bored? You ca type #bored and send Natasha and she will surprise you with a twist. Try it. 10. Want to get information related to any book? Natasha is thereto help. Just type #book followed by the book name. 11. This is related to Rajnikant! Natasha can also give you a rajni twist. 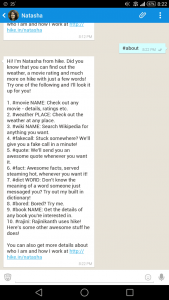 Type #rajni and see. 12. To know more about Natasha, type #about and she will give you her details. Meanwhile, I also have a cool trick to make you hide yourself while you see messages sent by your friends on Facebook. Don’t Miss It. Check out this trick on How to disable seen messsages on Facebook. Hope we are able to deliver the complete details of hike natasha bot and rajnikant on hike messenger. We are sure you have liked it. Why don’t share it a bit with your friends? 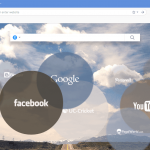 Go social and click the share buttons. It helps us to reach out to more people and post more awesome stuffs! 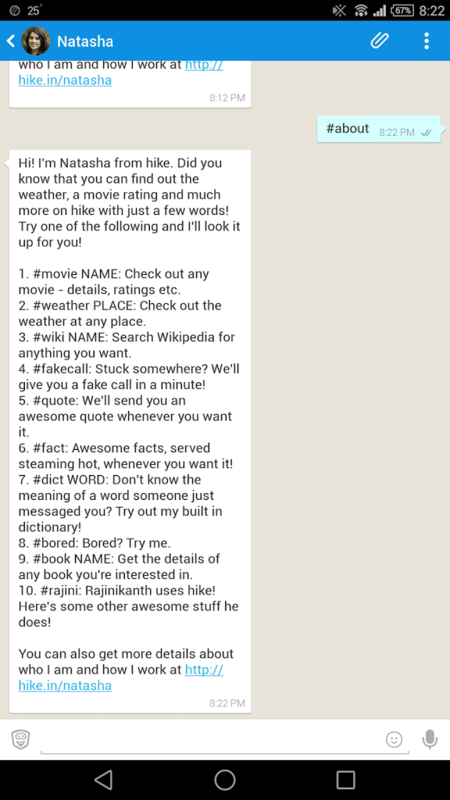 Thanks for reading how to activate rajnikant on hike messenger. Keep Visiting.